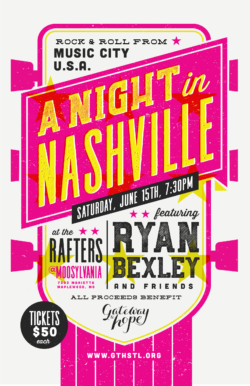 Join Gateway to Hope for A Night in Nashville featuring Ryan Bexley and Friends! Tickets are $50 and include the concert and light appetizers. Cash bar is also available. Doors open at 7pm and the show starts at 7:30pm. The Rafters at Moosylvania is located at 7303 Marietta Avenue, Maplewood, MO 63143. To register click HERE!